The year isn't even two weeks old and I've been reduced to quoting Austin Powers. Yes, knitters, I've lost my mojo and I'm not sure it's ever coming back. The clock struck twelve on December 31st and I waved goodbye to the old year . . . and my knitting resolve. I don't know why it left. I don't know where it went. All I can tell you is that my mind is filled with projects I'd love to start but my hands refuse to cast on so much as a single stitch. I still pore over patterns and pet my stash. I dream about finishing the grey Step socks and starting the Celtic Sweater just for me. So why don't I quit dreaming and start doing? What's stopping me? Enough already with the lethargy. Wake up, Bretton, and start knitting! Good advice. If only I'd follow it. Basically I'm feeling overwhelmed. What I need is to disappear into the book I'm working on and let myself sink into my own imagination and just let the rest of the world go to hell. Unfortunately that's easier said than done. The world is too much with me right now and I can't seem to shut it out. You see, that's the thing about being a night person living in a day people's world. I've been trying to be an early to bed/early to rise kind of girl and to nobody's surprise but my own (hope spring eternal and all that) I'm failing spectacularly. What I should do is give up the ghost. It was a grand experiment but it ain't working and time is running out. Sleeping late isn't a crime against the nation and even if it is, who cares? Will the earth stop spinning on its axis if I work until four a.m. and sleep until ten or eleven? Goldisox doesn't mind. The parrots don't mind. Why on earth am I making it so blasted hard on myself? No sleep. No knitting. That does not a happy (or productive) writer make. If you have any suggestions on how to recover my missing knitter's mojo, I'd really love to hear them before I forget how to cast on. Laura asked about new books on the horizon. 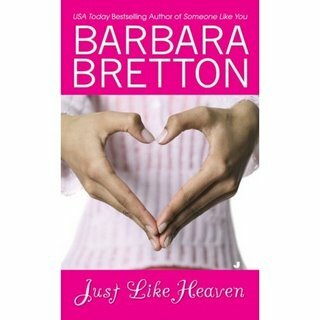 Just Like Heaven will hit the stands late next month. There's a sneak peek on my website. BTW, if you scroll down the vertical nav bar on the right, you'll find our list of contributors. Make sure you visit our knitting bloggers and check out their websites too. First, it sounds like you should sleep late for about a week. Second, sometimes you just need to take a break. Give yourself permission to not knit without feeling guilty or thinking about projects or any of that baggage. After a time, you'll be desperate to get the needles back in your hands. You're just burned out. You know it happens with writing. Why not with knitting? Conformity is highly overrated Barbara! Work when it works best for you. Stay in your pajamas until 2 pm if you want. Give yourself some TLC. As far as knitting.... do you have a local knitting pal or two that you'd want to spend time with? Set a time to get together and begin projects at the same time. Have coffee (or beverage of choice....wine?) and a treat (chocolate anyone?) Share your knitting angst. Someone always has a better idea on how to handle my problems than I do when I'm in the midst of them. That's what friends are for! I think you're trying to do too much at once: write your book, knit, keep up with the blog and your web site, and change your circadian rhythm. My advice? Put your knitting needles away, go back to your normal sleeping pattern (doing exactly what Nancy suggests) and write your contracted book. That's it. Period. Do nothing else. If you feel like it, visit the blog when you're winding down at 4 a.m. and let us know how it's going. Or tell us another one of your great childhood stories. But only if you feel like it. Somewhere along the line, your hands will start to crave those needles and yarn you've hidden away. It may be in a week or a month. Or maybe longer. But that's when you'll know you've got your knitting mojo back. My daughter not only kept me in labor for days, she didn't want to be born until 2:27 am, and was and is forevermore, a night person. Even now when she needs to BE at work by 6 am, she won't go to bed before 11, and if she had her druthers would be up to 3 or 4 and sleep til noon. Hubby and I live a 2nd shift life as well - in bed by midnight and up at 8:30 - I refuse to get less than 8 hours sleep a night and I won't answer the phone til 11 am. Once you're sleeping well and *on your terms*, your desire to knit will return - I'm sure of it! Try making a purposeful decision to set the needles down until a specific date -- because then it's your decision and not a whim or mood -- and really mean it. No knitting allowed until whenever. No fondling yarn, no leafing through pattern books, no staring at sweaters on strangers' bodies in the mall. Call it research -- tell yourself you want to know just exactly what non-knitters do to keep their hands busy. Or is it possible to adjust to inert fingers? I tell you what, you'll learn what knitting means to you if you give it up on purpose. Maybe less, maybe more than you thought. Take a guilt free break, you deserve it. I have lost my mojo tons of times, usually when I am borderline depressed. It takes a project that makes me say "oooh" or just for the funk to past, to get mine back! Don't worry, you are great, we all love you! Knitting's supposed to be fun. If the urge isn't there, so what? It'll be back when it's back. As for the battle of the Circadium rhythms...why fight your natural inclinations if there's no compelling reason to do so? Me, I'm a day person. I NEED that daylight, and have to spend lots of time outside soaking it up. I fade with the moonlight. Give me an afternoon nap, and I'll stay awake and enjoy a bit more moonlight -- but still, come midnight, I turn into a pumpkin. Just my natural inclination. I've learned not to fight it no matter how much fun you night owls seem to be having without me. GET FELTED - ONE LAST WINNER!